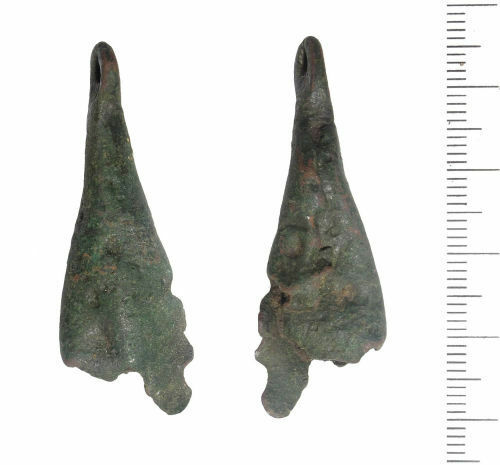 A sheet copper alloy, teardrop shaped bell dating from AD 1100 - 1400. The sheet has been rolled into a cone, and four incomplete pointed tabs at the base would have been bent inwards. There is a seam along the back of the bell. The oval suspension loop is flat. Many similar bells are recorded on the database, for example SUSS-A99234 and SUSS-3EDC42 which cites Read (2001) fig 37, no.464, who suggests a fourteenth century date.